"I can wear my wedding ring for the first time in years." -- Patient who underwent lymph node transfer for upper extremity lymphedema. What is vascularized lymph node transfer (VLNT)? Vascularized Lymph Node Transfer (VLNT) involves transplanting lymph nodes from one part of your body to the limb with lymphedema. The blood vessels providing circulation to the lymph nodes are reattached to blood vessels in the swollen limb using a microscope. These transferred lymph nodes then drain trapped lymphatic fluid out of the affected arm or leg. Lymph nodes can be harvested from the groin, under the arm, or from the neck. How does a lymph node transfer work? Lymph nodes contain growth factors that stimulate growth of lymphatic vessels. The trapped lymphatics have been shown to find their way to the transferred lymph nodes. One mechanism of action is believed to be that lymphatic fluid entering the lymph node is able to enter directly into the venous system through the lymph node. Lymphangiogenesis (new growth of lymphatic vessels) into transferred lymph nodes has been demonstrated in our patients using near infra-red lymphangiography. Lymph entering the lymph node can then enter the venous system through interconnections between lymphatics and tiny veins within the lymph node. We have confirmed this using near infra-red lymphangiography at the time of surgery, where we can demonstrate fluorescent dye entering the venous system through the lymph node flap. Another proposed mechanism is that the transferred nodes restore the continuity of the disrupted lymphatic system. For example, if lymph nodes were removed from under the arm in a patient with breast cancer who developed lymphedema, the lymph nodes are placed under the arm and act to "bridge" the gap. There are several scientific papers supporting this mechanism. Can a lymph node transfer cause lymphedema? The most common question and greatest concern for our patients is the risk of developing lymphedema at the site where lymph nodes are removed. Although this is an acknowledged risk of lymph node transfer, Dr. Smith uses Reverse Lymphatic Mapping, a technique he developed for vascularized lymph node transfer with his colleague Dr. Dayan, to avoid taking lymph nodes that drain the extremity. 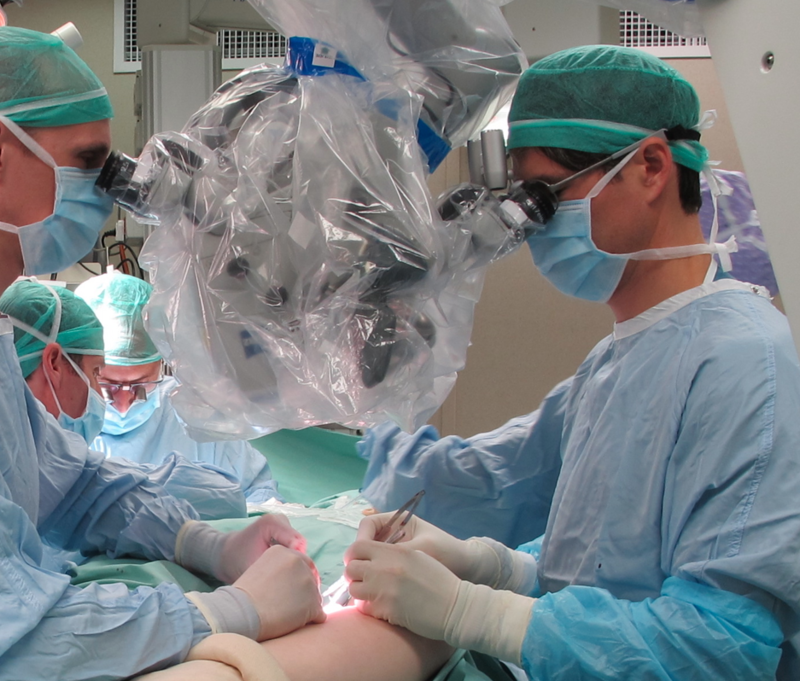 Dr. Mark L. Smith, with colleagues at Ichilov Medical Center, performing first lymph node transfer in Israel. What is involved in this surgery and recovery? Most lymph node transfers involve 3-6 hours of surgery which include lymphatic imaging in the operating room. The hospital stay is 1-3 nights and the recovery time is typically 2-3 weeks. Treatment by a lymphedema therapist both prior to surgery and post-operatively is recommended for optimum results. How effective is lymph node transfer? Lymph node transfer is not typically a cure for lymphedema, although patients often report significant improvements in symptoms such as a reduction in the size of the extremity, a reduced sensation of "heaviness", a reduction in infections (cellulitis), increased range of motion, or a reduced need for a compression garment. Is lymph node transfer covered by insurance? Lymph node transfer is usually covered by insurance. Dr. Smith participates with most major insurance carriers including Cigna, Aetna, Blue Cross/Blue Shield, Oxford, and United Healthcare. Am I a candidate for lymph node transfer? Most patients who develop lymphedema following cancer treatment are good candidates for lymph node transfer. Both early as well as advanced cases of lymphedema have been successfully treated with lymph node transfer. However, as lymphedema becomes more advanced, the fluid is eventually replaced with fatty tissue and scar. Lymph node transfers can help remove excess fluid, but in long-standing cases involving excess fatty tissue, additional treatments such as liposuction may be required. Primary lymphedema (lymphedema that occurs spontaneously often due to an abnormally developed lymphatic system) may be treatable, but requires careful workup and imaging to determine if lymph node transfer is appropriate.